Increase your brand awareness & your profits. ComF5 helps create brand awareness in online business marketing by combining traditional marketing tools with modern technology, such as video enabled email campaigns. Your imagination is unfettered using comF5’s platform, allowing you to take full control of your online business marketing efforts. ComF5 provides only the best combination of all the tools that are available for marketing or promoting yourself or your business online. We provide the power of brand integration into multiple platforms. Combine that with the right tools to successfully measure and refine your marketing efforts and you get the most complete Internet Marketing System available. All in one place and at a GREAT value. ~ Build and maintain better relationships by personalizing all of your customer and client contacts with video. ~ Make business or organizational presentations with slides and guest speakers using live or recorded broadcasts. ~ Manage and publish your pictures and videos. ~ Create your own web pages without using a hosting service. ~ Collaborate with associates with shared contact lists, calendars and documents. ~ Capture leads with web forms or with text messaging, follow up with campaigns and autoresponders, all with robust reporting. We invite you to investigate in detail all of our F5 products. We think you’ll agree, the possibilities are endless when you put comF5 tools behind your marketing approach. Paul, I have seen enough how do I sign up? Sign up here! A Panera Bread Co. restaurant in St. Louis, that was converted to a non-profit cafe, is allowing customers to choose what they want to pay for their meals. The owners came up with this innovative approach as a way to give back to their community. Cashiers show customers what their order costs and then allows them to pay what they want or can afford. Those who can't pay are asked to donate their time. The owners are not sure if it will be profitable but they are willing to test people's generosity to find out. What do you think of this business model? Could you try something like this with your business? Recently I had a great opportunity to contribute an article to an incredible project that provides practical tips, powerful strategies, and motivational messages to help people stimulate their personal economy. 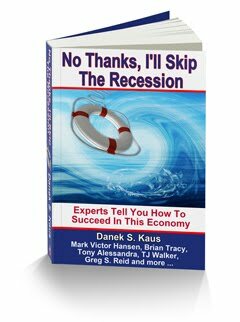 This powerful information is included in the free eBook by Danek Stephen Kaus, "No Thanks, I'll Skip the Recession," with articles from Mark Victor Hansen, Brian Tracy, Tom Hopkins, and many more great thinkers, entrepreneurs, and motivators. My article is entitled "re:Position Your Perspective", which motivates and challenges people to become more entrepreneurial due to the current state of the job market. It's right in line with what I write about concerning creating your personal enterprise. Click here to get your free copy. Enjoy! Let me know what you think of the article and the eBook overall. America’s economic landscape will probably never be as it was before the recession. Consequently, the career landscape has also changed forever. And while the financial pundits spend their time talking about corporate profitability, we need fresh thinking for helping individuals and families enhance their personal profitability by repurposing, repackaging, and repositioning their professional pursuits. We are quickly shifting into an entrepreneurial economy, which means more people need to acquire entrepreneurial skills to survive the shift. "3hrive 3.0: Entrepreneurial Skills for the Entrepreneurial Economy", happening May 22 in Atlanta, is a career transition workshop with an entrepreneurial twist. It will provide people with a strategic approach on how to flourish with the right perspective and skills in this current and future economic environments. The goal is to equip, enrich, and empower individuals with motivational instruction and stimulating exercises that will position them for lasting success in their chosen career/business path. rePurpose their path in life! A few months ago I wrote an article about more people needing to consider entrepreneurship as 'Plan A' instead of just 'Plan B'. This is an opportunity to craft that plan. It's much better to be proactive than regretful. So join us on May 22. Click here for more information.